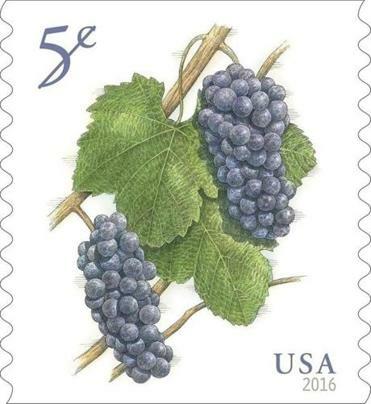 The US Postal Service has selected a Massachusetts artist’s illustration of pinot noir grapes growing on the vine for a new 5-cent stamp. The pen, ink, and watercolor illustration of the deep purple grapes by John Burgoyne, of West Barnstable, was one of about 40,000 submissions the service receives each year, according to Mark Saunders, a postal service spokesman. Only about 20 subjects make the cut, he wrote in an e-mail. The service uses a small group of artists to transform subjects into the illustration that appears on the stamp. Burgoyne’s work appears on 150 million stamps that were issued Friday, according to Saunders.